If you haven’t heard of the Krabi Province, you probably do know someone who’s been. It’s one of the most popular travel destinations in Thailand, with nearly two million visitors heading for this coastal region every year. It’s a beautiful area, and the landscape offers you the option to just sit on the beach and relax, or pump up on adrenaline with climbing and diving tours. Regardless of your choice of activities, it’s a great place to get value for your money. Here are a few highlights. * Rai Leh – this is where the rock climbers hang out; once you see the jagged surrounds, you’ll see why. Also popular with tourists. * Ao Hang – this is where the action is, with the massive party beach. Some say this is just too crowded and overdeveloped, while others say it’s the most fun they’ve ever had. * Ko Phi Phi – this is where the film “The Beach” was shot, so as you can imagine, it’s just beautiful. The thing about Krabi is that it’s hard to get a bad view. 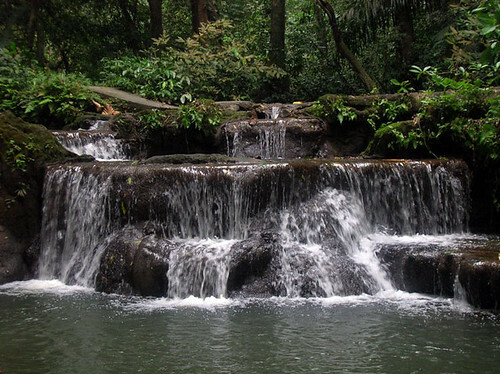 Waterfalls seem to appear around every corner, there are caves to be explored, swimming in the turquoise waters, and the impressive coral reefs. If you can tear yourself away from your chaise lounger, there is no shortage of things to do. * They say Krabi is the rock climbing capital of Thailand (which isn’t saying much as I don’t know of anywhere else that is popular for climbers). If you’ve never done it, this is a great place to do it, because you can get an experienced guide for cheap, and safety is well monitored. * Snorkeling is very good in Krabi, and tour guides from any of the beach towns offer both day trips as well as overnighters if you totally want to get away and do some serious underwater exploring. You could also hire a small boat (with or without a skipper) and just hop around to islands. There are hundreds of small spots along the coastline, from the “chicken” island to beaches that were film backdrops. It makes for a relaxed, casual day – if you find a spot you love, just stop and enjoy it. Barring all that, if you’ve fried your skin and wanting to de-stress, what about the spas? You can get a massage for next to nothing, or “splurge” on all day spa packages, which are still very inexpensive. Another highlight of a trip to Krabi is the food! I’d encourage you to reach out and try a few different things. 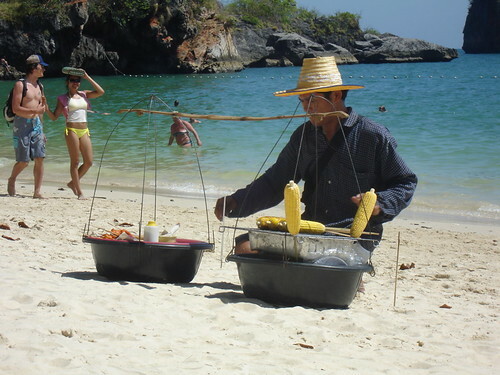 Pictured above is one of the food vendors that find themselves perched wherever there is foot traffic – even if that means carrying their mini-BBQ over onto the beach. In most of the villages, there are food carts offering up fresh and simple noodle dishes for bargain prices. They’re tasty and I’ve never heard of anyone having problems with cleanliness or the like. Krabi has a night market which has food too. Restaurants along the waterfront or just next to the beach tend to be the priciest, whereas as you head away from the busiest areas you get a better deal. Regardless, your pound stretches very far in this part of the world, so enjoy it. Rai Leh – this is where the rock climbers hang out; once you see the jagged surrounds, you’ll see why. Also popular with tourists. Ao Hang – this is where the action is, with the massive party beach. Some say this is just too crowded and overdeveloped, while others say it’s the most fun they’ve ever had. Ko Phi Phi – this is where the film “The Beach” was shot, so as you can imagine, it’s just beautiful. They say Krabi is the rock climbing capital of Thailand (which isn’t saying much as I don’t know of anywhere else that is popular for climbers). If you’ve never done it, this is a great place to do it, because you can get an experienced guide for cheap, and safety is well monitored. Snorkeling is very good in Krabi, and tour guides from any of the beach towns offer both day trips as well as overnighters if you totally want to get away and do some serious underwater exploring.